T-minus ten minutes until @BadgerSwimDive gets in the pool for finals on the last day of Big Tens! Catch all the action and analysis here! Starting off the night will be the mile, with @CierraRunge and Danielle Valley both within the top five times overall. Runge and Valley's biggest competition in the mile will be Rose Bi and G Ryan of Michigan, and Lindsey Clary of OSU. The mile has circle seeded heats, so many swimmers have already competed. The fastest heat is what will be competing in ten mins. 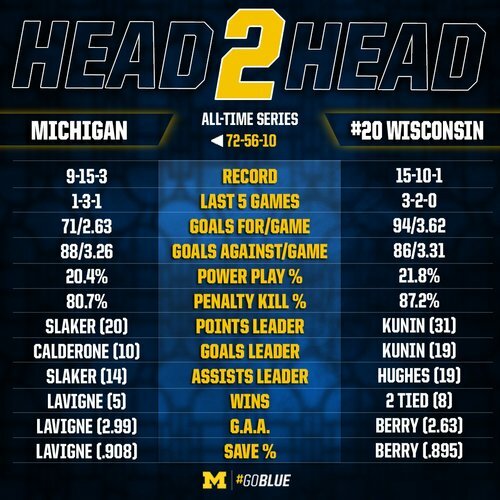 Here is our stats as we are a few hours from puck drop in Madison. Sophomore @gracetierney97 looks to have solidified a place in the top 16 with her 16:23.89 earlier today, which is a lifetime best. Tierney dropped 24 seconds (yes, you read that correctly!) from her seed time. In addition to the mile, 200 back, 100 free, 200 breast, 200 fly and 400 free relay will be contended for the Badgers tonight. Through three days of competition, @BadgerSwimDive sits in fourth place, behind Michigan, Indiana and Minnesota. The four top teams are all within 60 points of one another, so it all comes down to what happens tonight to determine a winner. Valley and Runge on the blocks for the mile right now. 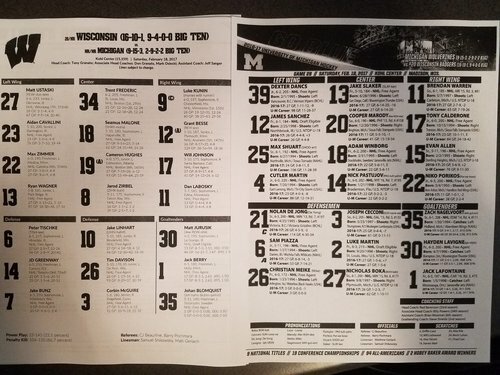 And we're back for game two of the White Out series with Michigan. 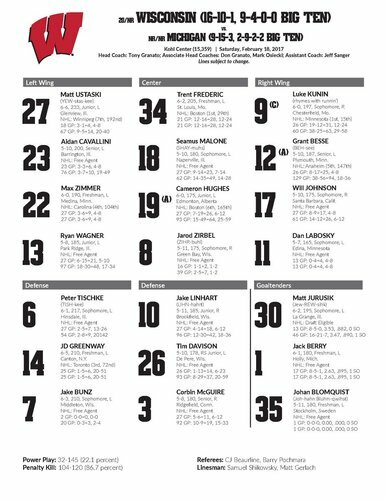 Puck drop is about 90 minutes away. 66 laps across the pool for Valley and Runge. It's a three swimmer battle in this heat so far between Runge, G Ryan and Lindsey Clary. At the 500, Michigan's Ryan leads the race, followed by Runge and Gruest Slowing of Northwestern. Runge and Ryan continue to separate themselves as the Pennsylvania natives and former training partners go stroke for stroke. At the halfway point of the mile, G Ryan of Michigan leads, followed by @CierraRunge and Valerie Gruest Slowing of Northwestern. 42 laps in and G Ryan is pretty much untouchable, with Runge about two body lengths behind, and the pack about two behind that. OSU's Lindsey Clary is creeping up on Runge, but Runge has her sights on Ryan and won't give up that quickly. G Ryan is about five body lengths ahead of anyone else with less than ten laps to go. It appears they have this race in hand. It looks like it's going to be Ryan and Runge for gold and silver. G Ryan takes the mile in 15:44.93 for Michigan. @CierraRunge takes second and Danielle Valley third. That's some hardware for the Badgers. Runge takes the school record in 15:51.72 and Valley swims a humongous 15:53.16. Grace Tierney also puts points on the board taking 15th. Madeline Hazle takes second in the 200 back B-final. Ready to go in the 200 back B-final is @JessUnicomb . Really strong field in this race. Winning the 200 back B-final is @JessUnicomb in 1:53.99. Unicomb was the fastest in the field by over a second. Up now in the A-final is @beatagurl . The freshman is going up against Indiana's Kennedy Goss and Michigan's Clara Smiddy. Another top three finish as @beatagurl takes third in the 200 back in 1:52.51. Badgers sit third behind Michigan and Indiana after the 200 back. Getting ready to go in the 100 free B-final is @abbyswim96 . The RS junior is proving to be a valuable add after transferring from Purdue. So Labosky replaces Freytag and Bunz replaces Hurley. Switching over to hockey before tonight's game - if you're looking for swim coverage follow our swim writer @kellmichelle895 . 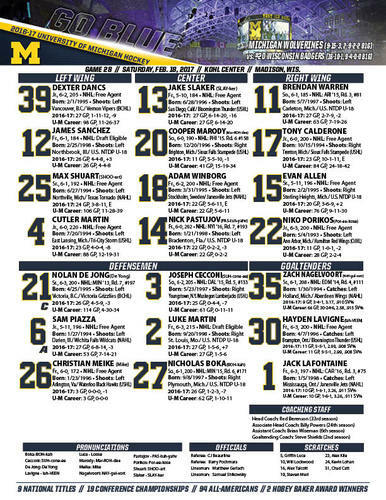 The Wolverines lineup tonight as we look to even the weekend series at WIsconsin. 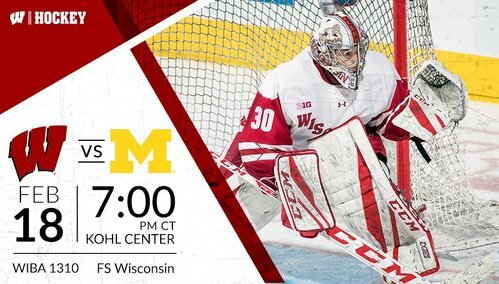 Zach Nagelvoort in goal for the Wolverines, Matt Jurusik for the #Badgers . 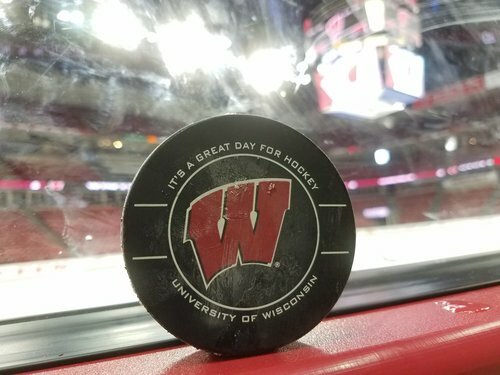 Faceoff at the Kohl Center about 5 minutes away.